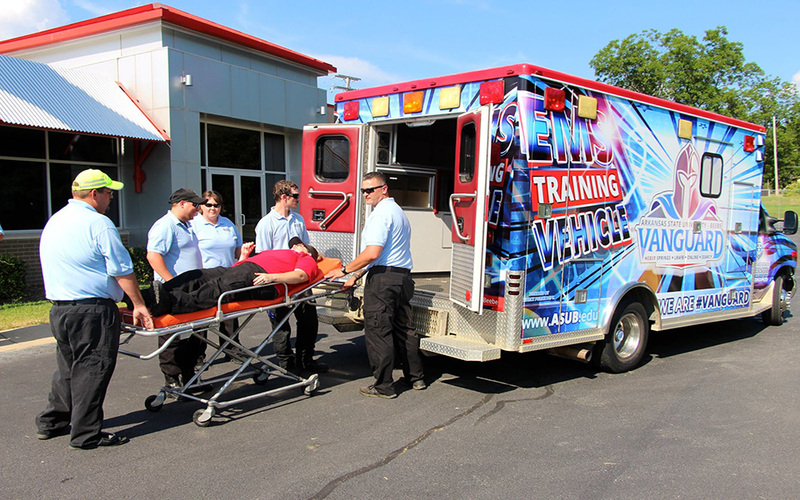 Arkansas State University-Beebe offers both Emergency Medical Technician (EMT) and Paramedic Level Training on the Searcy campus through the Emergency Medical Services Program. The coursework for this program prepares students to challenge the National Licensure Exam and begin a career in the field of EMS. Career opportunities available to EMS professionals include, but are not limited to, ambulance services, hospital emergency departments, urgent care and family practice clinics. Currently, there is a nationwide shortage of qualified EMS providers. This shortage allows graduates of ASU-Beebe's EMS program numerous job opportunities not only throughout Arkansas, but throughout the country as well. Classes are offered during the week (Monday, Tuesday, and Thursday) at night. ASU-Beebe offers the only 10-month, night-time paramedic course in the state. EMT classes are offered each Fall (August) and Spring (January) and last one semester. Paramedic cohorts begin in June of each year and are completed in July of the following year. For more information, call 501.207.6242, or email jcallen@asub.edu. Scholarships and grants are available for qualified students. For more information, contact the ASU-Beebe Office of Financial Aid at 501.882.8845. Please view Emergency Medical Services enrollment requirements for more information. The Arkansas State University-Beebe Emergency Medical Services Program is accredited by the Commission on Accreditation of Allied Health Education Programs (www.caahep.org) upon the recommendation of the Committee on Accreditation of Educational Programs for the Emergency Medical Services Professions (CoAEMSP). For a Student to qualify for the National Technical Honor Society, they must be enrolled in a technical course of study, be seeking a degree in their field of study, have completed 15 hours of credit at ASU-Beebe, and hold a cumulative GPA of 3.25 or better. Qualified EMT or paramedic students are recommended for membership to this society by their program director each semester.